I’m writing this from over in Indianapolis where I am a guest of the annual Thanksgiving Weekend convention that is Starbase Indy. Everyone is wonderful here, which you’d expect living in the future, though the qagh in the hotel’s restaurant does leave something to be desired. And speaking of speaking engagements, a couple months back I was down in Maryland for the annual Baltimore Book Festival. 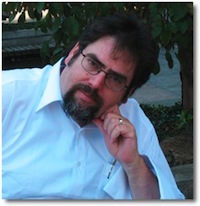 While there I met this week’s EATING AUTHORS guest, David Pedreira. 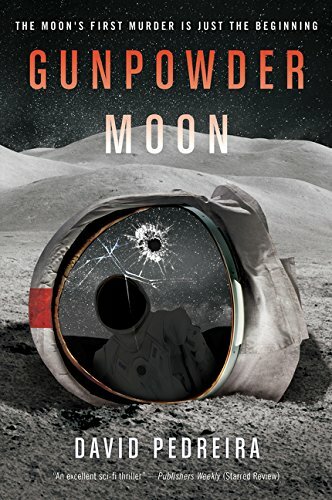 David’s novel, Gunpowder Moon, is a science fiction thriller about the first murder on the moon. Cool concept, right? Who needs a locked-room mystery when all your suspects on stuck on an airless world? 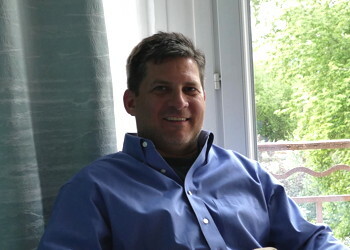 David is a journalist turned fiction writer. Gunpowder Moon is his first novel but surely not his last. LMS: Welcomne, David. Can you tell me about your most memorable meal? DP: Oh man, this is one of the hardest questions I’ve ever been asked. I’m a food junkie and my tastes run from serious cuisine to burgers and brats on the grill. I did a mental checklist of great meals over the years, and thought of everything from my aunt’s leg of lamb stuffed with spinach and feta cheese to my mom’s homemade marinara, cooked all day on the stovetop with meatballs and hot Italian sausage, and served over linguini. But those are regulars, so I suppose they’re disqualified. I’ve also had many memorable restaurant meals in the U.S. and overseas, particularly in Italy, France, Turkey, and Japan. But if I had to pick a meal that’s seared into my memory, I’ll go with a campsite lunch of brook trout and fiddlehead ferns at Sawyer Pond, in the White Mountains of New Hampshire. Sawyer is actually a small glacial lake about 50 acres in size, nestled in between three mountains north of the Kancamagus Highway. It’s about a 4.5-mile hike from the trailhead to the camp site, with terrain involved, so you have to be judicious in what you carry in: tent, sleeping bag, skillet, fishing gear, axe, food, long underwear, toothbrush, and a bottle of whiskey. The campsite is at about 2,000 feet of elevation, and the lake itself is gin clear, rock-bottomed, and deep. One of the local universities did a survey and found a maximum depth of nearly 100 feet. The indigenous gamefish include brook trout and German browns, but we were fishing from the shoreline so we couldn’t go after the larger “brownies.” They hang out deep. So the routine is this: you get up when it’s “crackin’” (dawn) and get fishing. By 10 a.m. or so on the first morning, three of us had caught maybe a dozen “brookies”—more than enough lunch for six people. A few of the other campers who weren’t fishing had collected a bunch of fiddlehead ferns. This is a wild mountain vegetable that grows out of the ground like a stalk of asparagus, but with a top shaped like a violin’s headstock. They are delicious; I’d describe them as a combination of broccoli and asparagus, with some artichoke thrown in. Thanks, David. You know, I just like saying “Kancamagus.” Though, it does beg the question, what kind of hocus pocus does a Kancamagus practice? This entry was posted on Monday, November 26th, 2018 at 7:30 am	and is filed under Plugs. You can follow any comments to this entry through the RSS 2.0 feed. You can leave a response, or trackback from your own site.